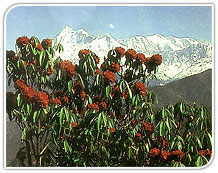 Kumaon Travel Guide, Kumaon Tour Guide, Kumaon Tourism Guide, Kumaon City Guide, Kumaon Travel Information, Kumaon Tour Information, Kumaon Tourism Information. The word Kumaon is believed to have been derived from "Kurmanchal" meaning Land of the Kurmavatar (the tortoise incarnation of Lord Vishnu, Preserver of the Hindu Trinity). Extending from the northern end of the Ganga plains right up to Tibet, Kumaon's endless panorama of scenic wonders is nothing short of romance with pristine and soul-lifting nature itself. Kumaon consists of districts of Nainital, Udham Singh Nagar, Almora and Pithoragarh. The land of Jim Corbett's legendary exploits, it lies due east of Garhwal from which it is separated by the eastern and southern flanks of Nanda Devi sanctuary leading down along the valley of the Ramganga. Well connected to different parts of the country, Kumaon hills provide vast attraction for the tourists, trekkers and pilgrims. The nearest airport for Kumaon is Pantnagar, 71 kms, from Nainital, 118 kms, from Ranikhet and 127 kms from Almora. The newly developed Naini Saini Airport at Pithoragarh shall also start, connecting Kumaon in near future with other parts of the country through commercial flights. The last railhead for Kumaon is Kathgodam on the main metre gauge line from Lucknow. From Kathgodam. regular bus services are provided by UP Roadways and the Kumaon Motor Owners Union, to Nainital (55 kms). Alrnora (90 kms) and Ranikhet (84 kms) etc. The beautiful scenery and the colourful life of Kurnaon, wrapped in the scenic wonders of many lesser known hill stations like Bageshwar, Binsar, Chaukori. Champavat, Kausani, Mukteshwar. 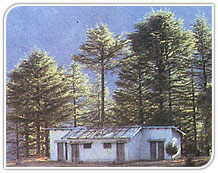 Munsyari, Ranikhet, Sitlakhet besides many other popular hill stations are waiting to be discovered.